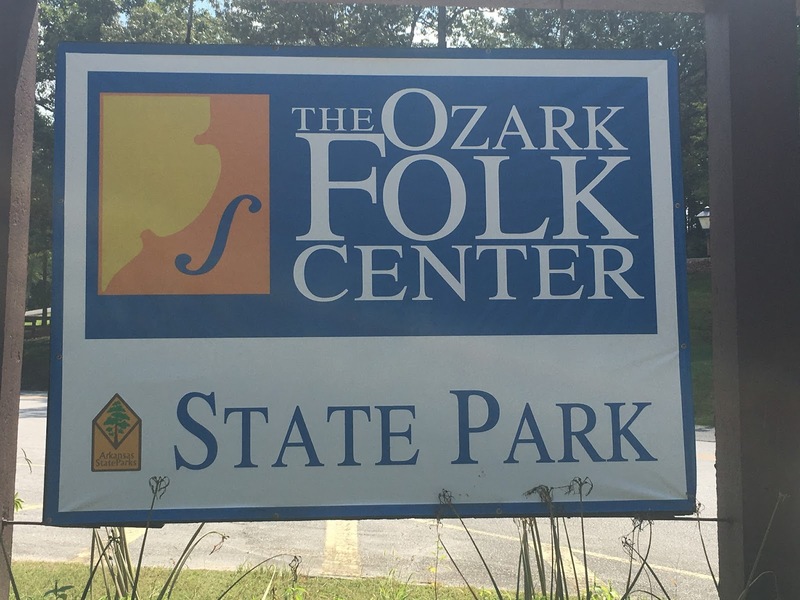 Another long weekend means another opportunity to visit State Parks and collect geocaches. 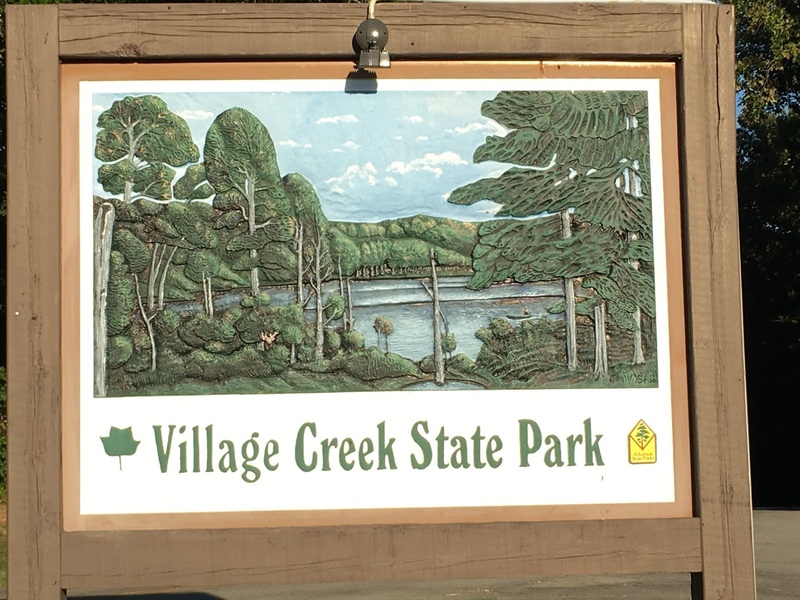 We found a cabin available at Village Creek State Park, just outside of Wynn. One of the best parts? No wifi and spotty cell service (double win, though it makes planning the next day's journey a bit more challenging). Friday afternoon we loaded up and headed out towards Village Creek State Park, arriving at our cabin by 6. After unloading we jumped on our bikes to explore the park and fetch the cache as well as the requisite park sign picture. One interesting feature is a giant Arkansas Flag. 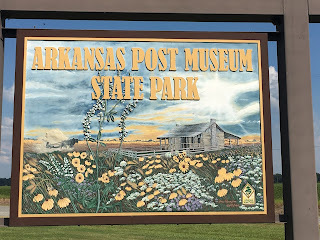 The flag poles on each of the 4 central stars have the appropriate flags on them for Arkansas' "owners"; the United States, France, Spain, and the Confederacy. 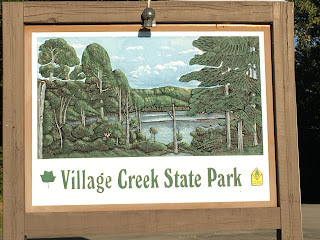 Lots to do in this park, miles of trails to bike and hike on, a couple of lakes to play in. Saturday saw us heading out on a 230 mile circuit to retrieve 5 Caches. 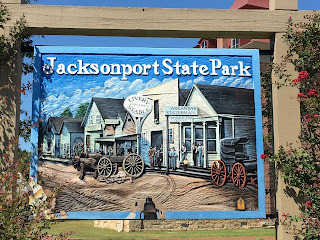 First stop, Jacksonport State Park. 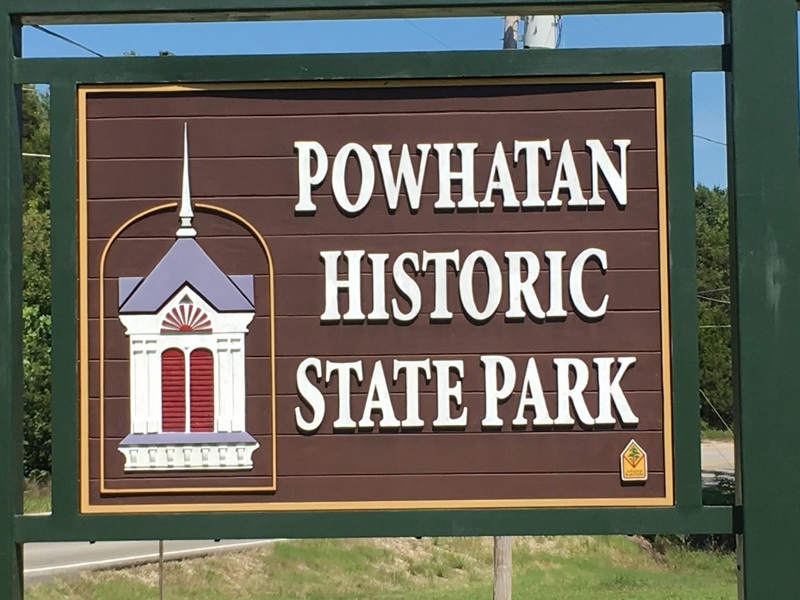 This town was the county seat for a short while until it was bypassed by the railroad in favor of Newport. The railroad offered to build a spur for $25,000. The town refused and died shortly thereafter. 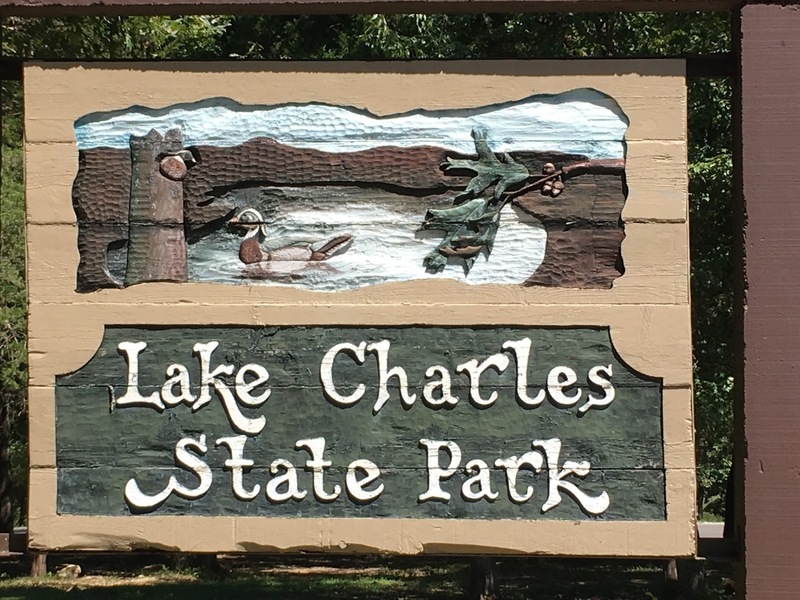 Next up, Lake Charles State Park. 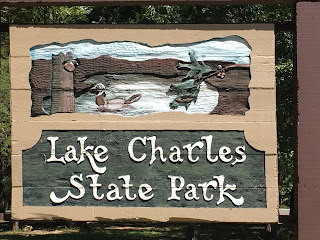 On the western shore of the Arkansas Fish and Wildlife Management's Lake Charles the State Park is mostly a fishing park. 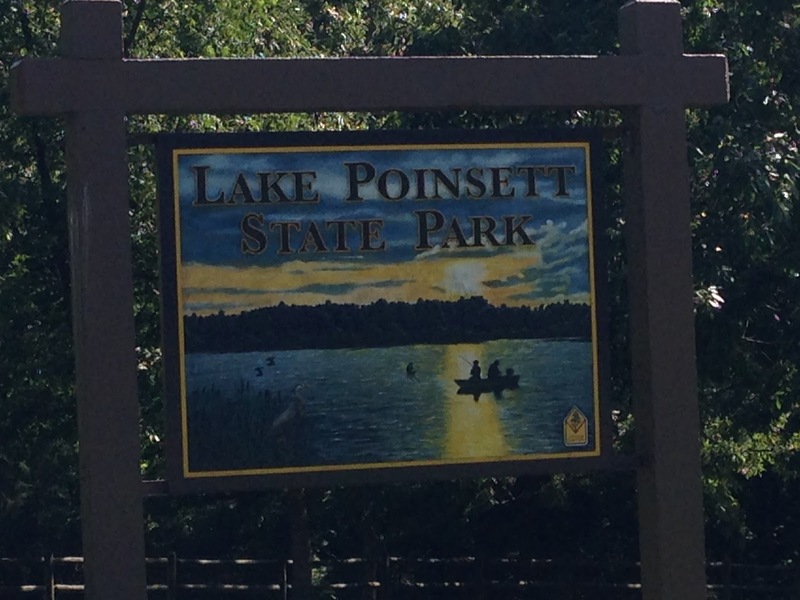 The Mockernut trail takes you alongside the lake and is a nice walk. 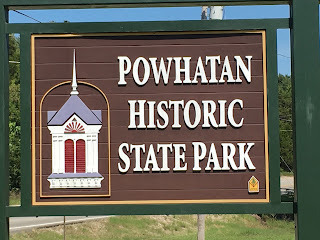 Down the road a short 5 minutes is Powhatan State Park. Took a while to find this cache and had to get the magic numbers from the staff. Folks keep stealing their cache. 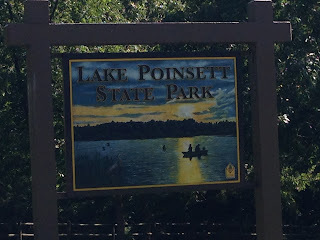 Moving on down the road we next stopped at Lake Poinsett State Park. This trail wasn't nearly as scenic as the one at Lake Charles but it was nice to stretch out legs. 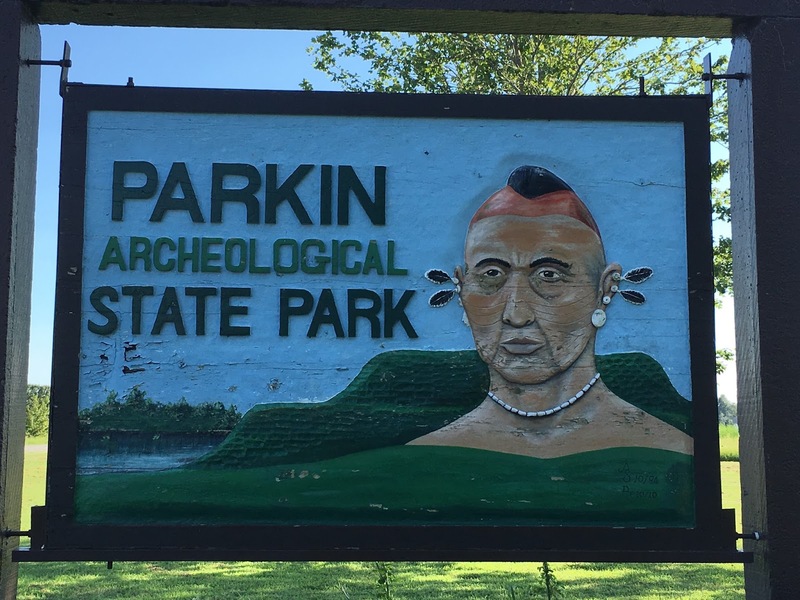 Load'em up, move'em out, back on the road to Parkin Archaeological State Park. 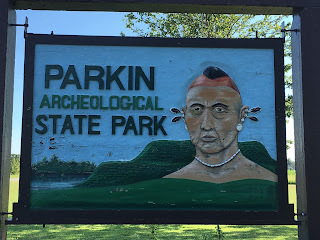 Former home of the Mississippians, watched a very interesting movie and had a great conversation with the interpreter. By the time we left it was obvious the kids were done. Fortunately, this was the last stop for the day. Saturday's tally is 5 caches, 230 miles, 8 hours. We headed back into Wynn for dinner at a local Mexican place, then back to the cabin for showers and bed. Sunday found us on the road again after sleeping in a bit, this time heading South. 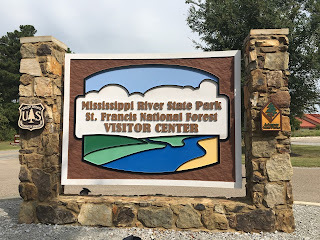 Our first stop was Mississippi River State Park. One of the newest parks it has a really neat visitor center. 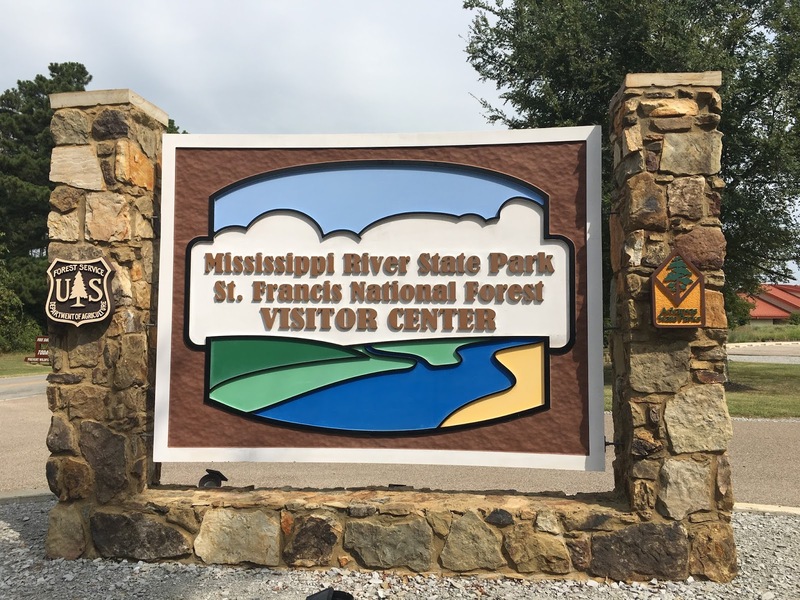 It is a joint venture between the State Park system and the US Forest Service since its in the St. Francis National Forest. 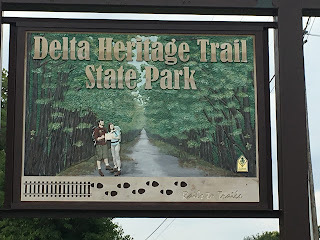 Next stop was just down the road to Delta Heritage Trail State Park. Union Pacific donated 73 miles of right away from the abandoned Delta Eagle route. The Park Service is turning into a biking and hiking trail. We road about 4 miles down and back. Right now about 27 miles are open. Eventually you'll be able to ride from Lexa to McGehee including crossing over the White and Arkansas rivers on the old trestles. 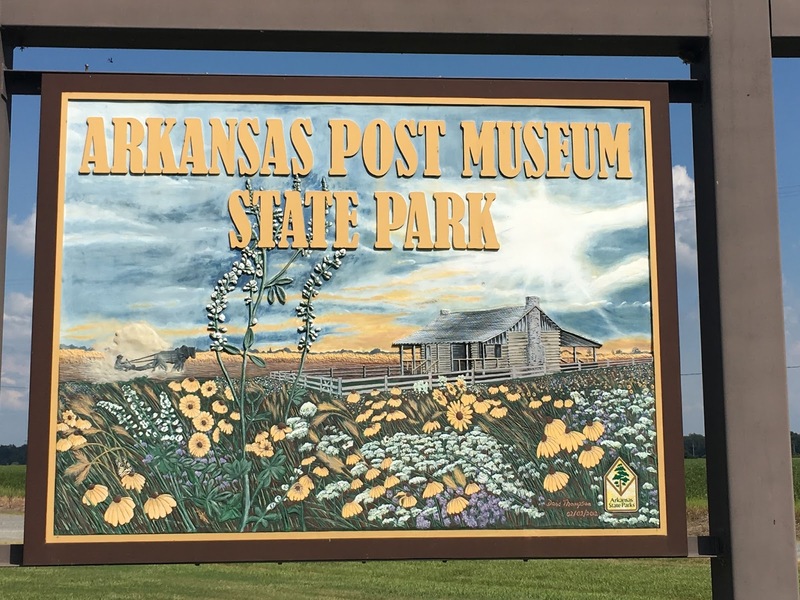 One last stop for the day, Arkansas Post Museum State Park. 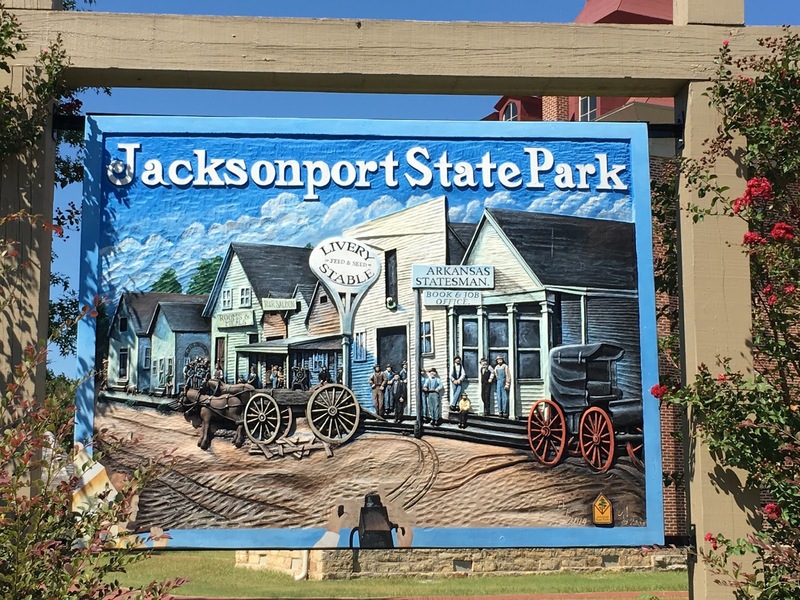 It was the territorial capital of Arkansas. From things I read later we probably should have gone around the bend to the National Monument where the post used to be but we didn't. That will have to wait until we're in the neighborhood again, which may be a while, it's not in our typical neck of the woods. Then it was a long 2 hour drive back to Village Creek. The highlight of the trip back was probably the half-dozen dust devils we saw in the freshly harvested fields. We tried to go kayaking but the fellow who told us the lake was open until 7 was apparently mistaken. Sunday's rally was only 3 caches, 220 miles, and another 8 hour day. Everyone was tired. Monday meant time to head home, but why not pick up one more cache. Before heading out we managed to get an hour of kayaking in, the kids seemed to enjoy it. We headed home via Mt. 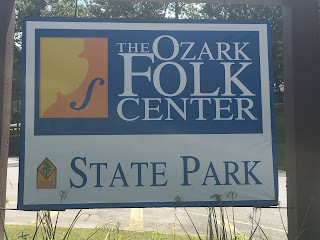 View, home of the Ozark Folk Center (no, this is not the shortest route from Wynn to Little Rock, in fact it's several hours out of the way, but it was worth it.) We got to see an old printing press in operation, and the kids got to dip candles.